This is information inferred from multiple DNA studies of North Africa and East Africa, along with references to studies of crania from North Africa and the South Mediterranean, and a knowledge of the paleolithic stone tool cultures of North Africa and the Levant. Circa 30,000 years ago, it is estimated from DNA studies that a Eurasian back migration occurred in two areas of Africa, the Mahgreb and the horn of Africa (studies of mt DNA haplotyes U and M1). This is supported by examination of the crania of the Oranian/Ibero Maurussian culture, which shows a number of robust skulls similar to early European ‘Cro Magnon’ skulls, represented by the Mechta Afalou ‘type’ in Morocco. The Mechtoid people gave way later to the more gracile Capsian people, which seemed to arrive about 7,000 years ago in Morocco, who probably came from the near East. Slightly later, possibly 25,000 years ago, the microlithic stone tool culture of Wadi Halfa, the earliest known wheat eating population from Northern Nubia, parents two new cultures; the Ibero-Maurussian/Oranian culture in the Mahgreb, and the Kebaran culture of the Levant. The population movement appears to have been mostly male mediated towards the East, with the ancient East African Y chromosome E3b1 probably making it’s way North along the Nile at this point and into West Asia. Conversely, there does not seem to have been a male population movement into the Western half of the Mahgreb at this time. But there does seem to have been some female movement into the Oranian culture. Both cultures to the West and East sporadically display evulsionof the incisors (female mostly) as a shared cultural trait. A Loring Brace study concluded of the Kebaran offspring culture, the Natufian, that it was almost halfway between Eurasian populations and sub Saharan African populations, being slightly closer to the Eurasian, in terms of cranio-facial measurements. This may not have been entirely as a result of populations mixing as the Halfans moved North, they could easily have had some Eurasian affinities from the earlier Eurasian back migration into the Mahgreb. The Brace study also noted that all the sub Saharan affinities of the Levant populations vanished with the end of the Natufian culture, which coincided with the expansion of the neolithic farmers, probably from Southern Turkey. Other works by Brace note an apparent population expansion from the East of the Med that expands right across North Africa in the Neolithic, arriving with the advent of farming and pastoralism in North Africa about 8,000 years ago. The North African Berber Y chromosome E3b1b is though to date to this later expansion, being an ~5,600 years old. However, the date estimates on the y chromosomes are tallying particularly well with population movements anywhere, so I personally suspect the E3b1b mutation is more like 7,000 years old. 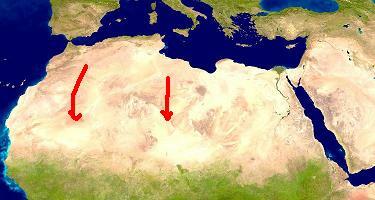 There was also a Southwards movement across the Sahara by the Eurasian haplotypes U6 (mtDNA) and R1b (YDNA). From this, it seems logical to conclude that the original ‘husband’ of the U6 haplotype was R1b, who was later ousted by the Neolithic newcomer from the near East E3b1b. This probably occurred during one of the Saharan wet phases, where the desert turned into Savannah, opening a route to migrations both ways. This has lead to the haplotypes U6 and R1b being far enough South by the time the Bantu expansion started to have been carried further South by the Bantu expansion, ~5,000 years ago. There has been some later Southward expansion of the E3b1b Y chromosome, with it being very common in Mauritania, and occurring down into Northern Mali in the Tuareg, but it’s smaller area of distribution supports it’s age as a Neolithic latecomer to North Africa. The Neolithic expansion is also the most likely origin of the other Eurasian lineages like H and J being present, as the Muslim conquest of North Africa appears to have made very little difference to the gene pool of places like Morocco; Berbers there being nearly indistinguishable from ‘Arabs’, suggesting the population was Arabised and not replaced. There appears to also have been a second migration into East Africa, probably also dated to the Neolithic, with ongoing population movements into historical times. This has carried Arabian variants of the E3b1 Y chromosome back into East Africa, along with various maternal lineages like J and pre-HV. The ~30,000 year old Eurasian back-migration, with mt DNA M1 and U, Y chromosome R1b and possibly K. This led to a U haplotype specific to North African (U6) and some U clades specific to East Africans. The ~25,000 year old Northward Nubian migration. This seems to be the most likely route for the E3b1 Y chromosome to have taken to reach the Levant and North Africa. Some L haplotypes also appear to have moved into Egypt area from the horn of Africa. The population movement into the Levant seems to have been more significant than the population movement into the North West of Africa, which shows very little Y DNA traceable from the South, suggesting it was a smaller, more female mediated migration to the West. The population movement North East seems to have stalled at Southern Turkey (Taurus mountains) about 15,000 years ago. The Saharan Savannah crossing of ~12,000 years ago. This seems to have carried Y chromosome R1b and mt DNA U6 south as far as Cameroon. Mechta Afalou type people (close to European Cro Magnons with a lesser Nubian affinity) have been found as far South as central Mali and Niger (Gobero Kiffian burials) dating to about 11,000 years ago. It seems the Caucasian North African population crossed Southwards at this point. There may have been some movemnt North at this point, but it is uncertain. The Neolithic expansion, from ~ 9,000 years ago. At this point there seems to have been a major migration of people from the Eastern Mediterranean across the North of Africa and into the Horn of Africa, bringing mt DNA haplotypes like J, H, and Pre-HV; also several West Asian clades of E3b1 and other West Asian Y chromosomes. This was later followed by the Sub Saharan Bantu expansion which started about 5,000 years ago, and which probably absorbed any remnants of the early Holocence Eurasian back migration that were left South of the Sahara after it became a desert again. This would explain the trace presence of the Eurasian haplotypes in the West African population. How far has the back migration penetrated Africa? A rifle through some DNA studies suggest that the 50% Eurasian mark is reached in the North of the Sudan in the East, and in the South of Mauritania in the West. Ethiopia shows ~40 Eurasian y/mt lineages. Strangely, 40% of the Y chromosomes sampled in Cameroon are R1b (20% total Eurasian). Even more bizarre is that one inland tribe, the Uldeme, have R1b at 95%, which rather sinks the theory that the R1b is present from slave traders (it’s best explained as an odd, old, founder effect). The questionable contribution of the Neolithic and the Bronze Age to European craniofacial form, C. Loring Brace, 2005. Clines and clusters versus Race: a test in ancient Egypt and the case of a death on the Nile, C Loring Brace 2005.
mtDNA Analysis of Nile River Valley Populations: A Genetic Corridor or a Barrier to Migration? Krings et al, 1999. Phylogeographic Analysis of Haplogroup E3b (E-M215) Y Chromosomes Reveals Multiple Migratory Events Within and Out Of Africa. Cruciani et al 2004. Y-chromosome analysis in Egypt suggests a genetic regional continuity in Northeastern Africa., Franz et al 2002. Mitochondrial lineage M1 traces an early human backflow to Africa, Gonzalez et al. A Back Migration from Asia to Sub-Saharan Africa Is Supported by High-Resolution Analysis of Human Y-Chromosome Haplotypes,Cruciani et al 2002. The Emerging Tree of West Eurasian mtDNAs: A Synthesis of Control-Region Sequences and RFLPs, Macauley et al 1999. Mitochondrial DNA transit between West Asia and North Africa inferred from U6 phylogeography,Maca-Meyer et al 2003.